An ornamental shrub with large white star shaped fragrant flowers. 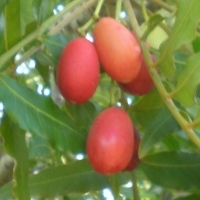 The large edible plum has a soft pinkish flesh. Fruits are delicious eaten whole including their skin and seeds. 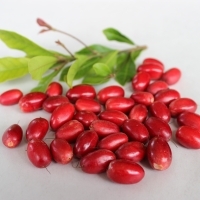 The flesh is a sweet cranberry flavour and can be used fresh in desserts, ice cream, yogurt, cakes and sauces. Fruits preserve well as jams, jelly's and chutneys and can be frozen, dried or bottled. With its sharp thorns this shrub makes an effective and almost impenetrable hedge. It also makes a beautiful bonsai specimen. Trees are tolerant of salt and wind and do not have invasive root systems. 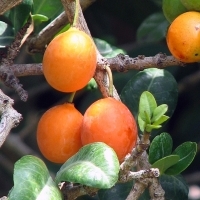 A small South African, very ornamental fruit tree. It flowers and fruits from summer to autumn. 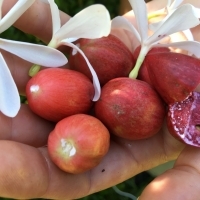 The red fruit, borne in clusters have thin skin with a pleasantly sour flesh. They can be eaten fresh, made into jellies, jams and preserves or a delicious rose wine. The bark can be used for dying, it produces a mauve - pink colour. Attractive to birds and butterflies it is a slow growing but long lived tree. Plant a minimum of three trees to ensure cross pollination. The branches are brittle in heavy winds so protection with a wind break is recommended. 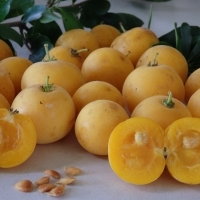 Fruit is very juicy and aromatic and is the size of a small plum. 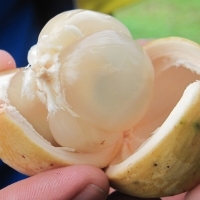 It may be eaten fresh and the flesh has an extremely high vitamin C content. It may also be cooked to produce jam, juices and alcoholic beverages. It also has 2 small very tasty high protein nuts. It is a large, dioecious, deciduous tree which grows wild in northern South Africa. 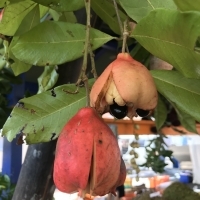 A tropical tree native to Madagascar, bearing round fruit 4cm diameter, that is green with white dots, and that turns brown when fully ripe. The pulp is moderately juicy, with a slightly acidic flavour. Meduim sized tree 10 - 15m. Fruits have thick yellow leathery skin surrounding sweet, slightly acidic flesh, the flavour has been compared to grapes or sweet grapefruit. Very tropical, not suited to areas with cool subtropical winters or temperate regions.